Copy And Paste Ads.com Review: What They Do Not Tell You! I want to start off by saying that you can make money if you find someone willing to pay you $149 to copy and paste ads online. So know that I’m not saying you can’t make a buck from this. 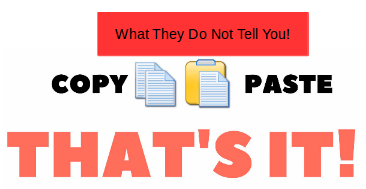 Now that we got the money stuff out of the way, in my Copy And Paste Ads Review, I want to go over what you are really getting into. I feel like you should know what they do not tell you if you do decide to pay this $149 with no refunds just to place ads online. I’ve said this before, copy and paste ads online isn’t new. It’s been around since dial-up with different systems circulating online. Back when I tried it, it was a CD that I received stating that the CD had all the details needed to make money online to copy and paste ads online. Once I paid and got my CD, there was nothing on the CD. I wasn’t going to go further with something that didn’t follow through. Not only that, if you think about in regards to what you’re going to do, it’s like one of those chain letters you get in the mail. Once you stop it stops, so it’s not like you are building a long term successful business. I want to go over the ad that Copy And Paste advertise since it’s the ad that you saw and your potential prospects will see. At the top of the ad, it indicates that you can make $300 per day. That comes to $2,100 a week to copy and paste ads online. Next, they have a video explaining to you what you get and what you will do to obtain that $300 a day income. They cover where you can place ads. The indicate that you can get paid through PayPal. 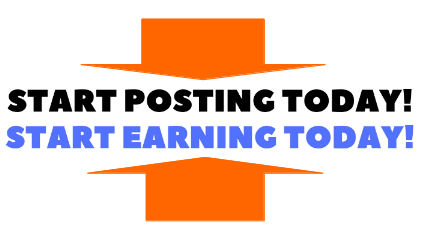 If you scroll down a little it states start posting today, start earning today. For someone who wants to earn money online, I get it that it might be something interesting. I too back in the day thought it would be great for me. Why Would Anyone Find The Copy And Paste Ads Appealing? I could speak for myself and tell you what was appealing to me. I could do it any time of the day. I’m not limited to a time frame. As for people who have other obligations, it’s appealing. The hours you put in isn’t time-consuming. With these types of opportunities, you can put in a few hours a day on your own time frame! The money is appealing. 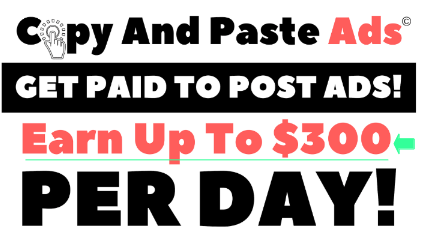 These ads claim that you can make a lot of money at any time frame, putting in a few hours a day! You really don’t have to communicate with anyone. You don’t have to speak to no one, making appealing money, putting in little hours a day on your own time frame! So I know why people would find an opportunity like that appealing. I wanted to go over it because they don’t tell you everything in their ad. Like I said above, it’s appealing. I know that ads are appealing so that people will buy, however, there are no refunds. Once you pay $149, someone made $100 from you and $49 of it goes to the guy who came up with his own personal copy/paste ad system. So everyone who made money is all good, except you! Meaning that if you are not satisfied with what you paid for, you got nothing out of it. You paid money, obtain some info about where you can post ads and other useless info with nothing to show for it. I say this because I felt I was duped once I paid for a “system” and obtain nothing from it. I want to cover more because what they don’t tell you can be a reason that you may say nay or yeah. The video in Copy and Paste Ads indicates where you can place ads online. ==> Get All The Tea That Helps You Build A Business Online! You see an image of…! What they don’t tell you is that you just can’t post ads everywhere randomly. You may get away with posting ads inside Craigslist, however, a lot of people end up getting flagged by Craigslist because Craigslist doesn’t allow ads where it pertains to multiple locations. As for Facebook, you have to find Facebook groups and then post your ads there. What I found out about the other classified sites is that they are outdated and some of these sites don’t even allow these Copy and Paste Ads on their sites. Another concern is that the ad says you can get paid $100 over and over straight into your PayPal. They don’t tell you that people’s PayPal accounts get terminated because of these systems. You may think you have all this money and the next thing you know you can’t cash out this money and your PayPal account is frozen. So you think you’re making a $100 over and over again, leading you to not get paid over and over again. I really want you guys to take the time to watch these two videos. In the Copy And Paste Ads site, they show how appealing and simple it is but is it really? Think about it. He paid $149. He did get prospects and one payment, so he got $100 back. $49 went to Admin fees. In the video the guy didn’t get flagged from Craigslist however, the list he got where he can place ads some of the links didn’t work. Some of the ads he placed were flagged. He also decided to use paid ads because the results from free ads he obtain from Copy And Paste Ads list were not producing. Now that is more money out of his wallet. He got more results from using the paid ads, yet he still didn’t make a substantial amount of money. Not only that, people pay an Admin fee to get a quality way to post ads online yet it didn’t deliver from the video indicated above. As you can see in the video the guy in the video above explained why he didn’t continue. He was not the first person I’ve come across that said that their PayPal account was frozen due to some copy and paste system. There are people who used other types of copy/paste systems where their PayPal account got frozen. At the end of the day, it is your decision on what you want to do. These systems are not as lucrative as the ads claim. I do understand the appeal because I too got suckered into it. At the end of the day, it’s not really a business, it’s more of a system or gimmick that you are paying for. I’m not saying you won’t make a buck from it, but it’s not long term. You’re just obtaining a one-time payment for something that is in my opinion, not a business. A real long term business is where you can obtain long term success by building your brand. If you have any questions or comments about Copy And Paste Ads, feel free to let me know below, thanks! If You Are Ready For Long Term Success, Click Here And Get Started Today! Make 2019 Your Victory Year: It Starts Here!